As part of the International Seminar Series, Thomas Hushek will present his talk “The Bureau of Conflict and Stabilization Operations and Its Role at the State Department” at noon Wednesday, March 1, in the Prairie Room of the Bone Student Center. This presentation will be an overview of the roles of the Bureau of Conflict and Stabilization Operations and issues in a variety of countries, and is part of the International Seminar Series. Hushek is currently the acting secretary from the Bureau of Conflict and Stabilization Operations for the U.S. Department of State. Hushek has spent his career as a foreign service officer, most recently serving as deputy chief of mission at the U.S. Mission to the International Organizations in Vienna. At the Department of State in Washington, D.C., Hushek served as director for Europe, Central Asia, and the Americas in the Bureau of Population, Refugees, and Migration, and director for Central Asia in the Bureau for South and Central Asian Affairs. Prior to this placement, Hushek served as deputy chief of mission at the U.S. Embassies in Dushanbe, Tajikistan, and Kolonia, Micronesia. 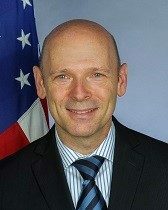 He has also had several assignments in or focused on Afghanistan, as the director for international narcotics and law enforcement in Kabul, the senior civilian representative at the Herat Provincial Reconstruction Team and Regional Command West, and as Afghan refugee coordinator in Islamabad and Kabul. Other Washington assignments include the Office of the U.S. Trade Representative and the Department’s Bureau of Democracy, Human Rights, and Labor, diplomatic postings in Khartoum and Moscow, and as an Afghanistan/Pakistan desk officer.